An orthotist is a person who measures, designs, fabricates, fits, or services orthoses, and/or assists in the formulation of orthoses. An orthosis is a device that is intended to be fitted to a person to correct a disability, or to support the person who has a disability. Orthoses are usually prescribed by a licensed physician. 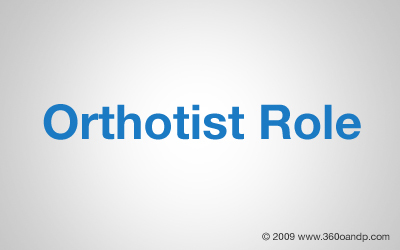 Orthotists take referrals from these physicians. A Certified Orthotist or CO is an Orthotist who has passed the certification standards of The American Board of Certification in Orthotics & Prosthetics, Inc. and maintains certification through mandatory continuing education program and adherence to the Board's Code of Professional Responsibility. A BOC Certified Orthotist or BOCO is an Orthotist who has passed the certification standards of The Board for Orthotist/Prosthetist Certification and maintains certification through mandatory continuing education program and adherence to the Board's Code of Professional Responsibility. WHAT SHOULD YOU EXPECT FROM YOUR ORTHOTIST? Whether your particular orthotic requirements are the result of disease, congenital anomalies or trauma, your rehabilitation program is individually prescribed. The prescription from your physician will be utilized by your orthotist and, if necessary, will consult your physical or occupational therapist. In many cases, particularly with custom fabricated devices, your orthotist will suggest follow-up visits to ensure continued proper fit and ultimate success in your rehabilitation program. Your orthotist should provide proper answers to all your questions and you should feel secure in the decision making. In many cases, your orthotist will follow your care with your physician in the form of written correspondence or oral conversations.